We are so pleased to post this review by Susan Dunman, aka AudiobookDJ. You can find her at her wonderful AudiobookDJ blog, or over at SF Site talking audio. Thanks Susan! Elantris was once the city where all men dreamed of living. Full of magic and marvels, its citizens were godlike in their appearance and had superhuman abilities. But now, Elantris is a place for the damned, offering only misery and despair for those unfortunate enough to be locked inside the walled city. For something is terribly wrong with the Dor, a mysterious force that randomly and instantaneously changes individuals from mortals to immortals. Now that change, called the shaod, transforms people, not into gods, but into grey-skinned, hairless creatures whose bodies cannot heal from wounds or illness. However, those same pain-racked bodies cannot die and are banished to the crumbling city of Elantris, away from the “normal” population of Arelon. The Crown Prince of Arelon awakens one morning to find his skin covered in the black splotches that are the first signs of the shaod’s transforming power. That same day his father orders the priests to perform a funeral service and send Prince Raoden to Elantris – a fate that befalls all who are considered “dead” after their transformation because they cease to have a heart-beat and do not need food or water to survive. This turn-of-events is not only disastrous for Prince Raoden, but also for his fiancee, Princess Sarene. She has just arrived from a neighboring country to meet her soon-to-be husband for the first time. Serene is only told that the prince is dead – not that he has been condemned to Elantris. But the suspicious Serene decides to remain in Arelon despite her betrothed’s death, vowing to uncover the truth about Prince Raoden’s untimely demise. This sets the stage for listeners to experience a remarkable story – made even more enticing by this audio adaptation. With a full compliment of narrators (28 to be exact), sound effects and background music, listeners can hear a three-dimensional production of Sanderson’s work – it’s like wearing 3-D glasses for your ears. To do justice to the book, this adaptation is produced in three parts, each approximately seven hours long. but only rarely do they invade the narrator’s sound space. In addition, the background music really sets the tone for the various scenes. And if you listen closely, you might find surprises. For example, in one ballroom scene, the music playing softly in the background is The Blue Danube Waltz, making me wonder if Johann Strauss, Jr. had done some kind of universe/time shift maneuver to get his music played in Arelon. 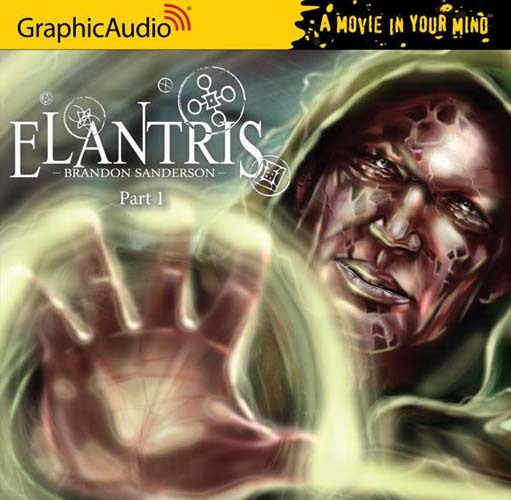 Elantris was Sanderson’s first published work, coming out in April of 2005. He explores themes of love, politics, religion, and eternity in intriguing and imaginative ways. This audio production compliments his work in a very satisfying way and I’m looking forward to hearing part two! Note: For those who do prefer single-voice narration, Recorded Books offers an unabridged narration by Jack Garrett.